Consumers sometimes find it difficult to find a reliable company or trader with tales of rogue traders causing many people to fear being ripped off. At the same time, reputable traders who take pride in doing a good job at a fair price deserve to be viewed credibly. 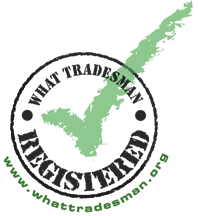 Operated by the London Borough of Bexley's Trading Standards Team in partnership with Siteon Ltd, the Bexley 'What Tradesman' scheme aims to help take the headache out of finding a reliable trader. It quickly and easily allows potential customers to identify traders who have been rated by feedback gathered from previous customers. Participating traders can also benefit from the scheme as it allows the quality of their work to be recognised. The scheme is free to consumers, operating costs being borne by the participating traders. The scheme covers not only domestic building works and related home improvement services but also general building and domestic appliance repairs and motor dealers and servicing. To proceed click on one of the tabs above.